The service also provides carer relief or respite care. The philosophy, vision and mission statements of the Brain Injury Rehabilitation Service are aligned with the Canterbury District Health Board’s values to care and respect for others, integrity in all we do and responsibility for outcomes. To be a collaborative specialist service which delivers quality neuro-rehabilitation. The Brain Injury Rehabilitation Service uses an Interdisciplinary Team approach. The patient is the central focus of the team and is involved as a team member with goal setting, family meetings, etc. Families and carers are encouraged to participate when practical and are provided with support and education from the Interdisciplinary Team. Collaborative practice is an important aspect of the Interdisciplinary Team function. It is facilitated by daily and weekly team meetings within office areas based in the ward and joint therapy sessions when indicated. The weekly Interdisciplinary Team meeting ensures the communication of assessments, goal setting and the completion of patient’s rehabilitation plans to provide optimal care. By working together and with the patient optimal outcomes are achieved. The Brain Injury Rehabilitation Service offers an outpatients service. The outpatient service provides 1:1 sessions, group therapy and hydrotherapy for Ministry of Health patients and ACC Concussion Clinic. 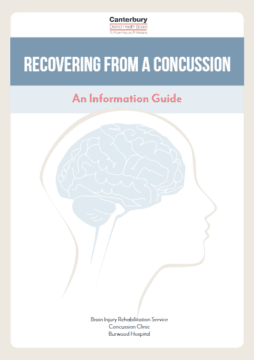 The Concussion Clinic is an early intervention service funded by ACC providing assessment and intervention for people with Mild Traumatic Brain Injury (MTBI) including those with post Concussion Syndrome (PCS).